Find the best camping toilet right now! If you have ever been camping or travelling in an RV or camper, you’ll know how important it is to have easy access to toilet facilities. In fact, having the best portable camping toilet you can afford and can fit into your vehicle is one of life’s essentials. Sometimes, there just aren’t any public facilities to be found. Other times, it wouldn’t be possible to park your vehicle if you weren’t fully self-contained. 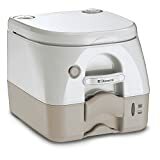 As a starting point, you need a camping toilet that has the right dimensions for your own situation, is portable, easy to use, easy to store and easy to clean. These days, camping toilets come with a heap of additional features. This can sometimes get a bit confusing, so the great news is, we’ve done all the hard work for you. The reviews are personally written by us, as avid and longtime campers and road trippers. Unlike many websites, you will find reviewing camping and portable toilets, our reviews are not cut and pasted from Amazon or other people’s sites. We have used these toilets all over the place. We’ve had small toilets in tents, larger (but still compact ones) in vans and fixed toilets in RVs. We’ve even dug holes when we’ve needed to. We work with RV and motorhome companies all over the world as a result of our experience. You can trust these reviews because they are real information written by real people.